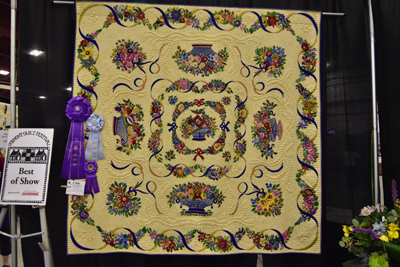 Best of Show Quilt "Floral Treasures" by Janice Cunningham. .
My oldest daughter and I celebrate our birthdays each year by attending The Vermont Quilt Festival. No need to shop for a gift for either of us as we select our own gift when we shop in the wide variety of vendor booths while there. 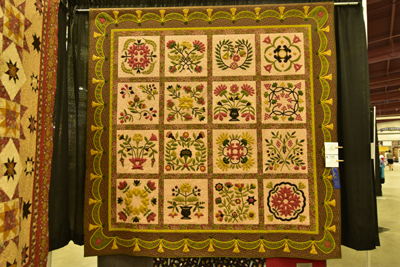 My husband goes with us each year to photograph the quilts and this year we went on Sunday, June 25th. It was the last day of the show and is always a shorter day, but often that better matches our energy levels. It is over an hour away from home and so going for about 6 hours, makes for an eight hour day total, by the time we return home and that seems to be sufficient challenge for my body! There is a lot of walking and this is the one time of year that I use a walker, though in truth I take it mostly as it makes a wonderful shopping cart with its large basket! Detail of the center motif. 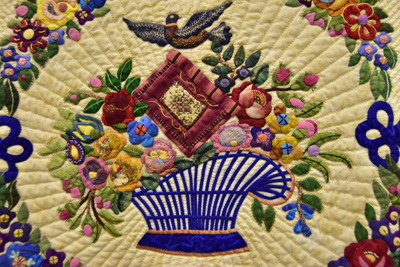 This is all hand-appliqued,embroidered and quilted. We are familiar with the lay-out and scope and know how to time ourselves to see all the new quilts, some of the antique ones and visit the vendors' shops. My husband's pictures give me all the time I want to spend studying the contest quilts at home on my computer while sitting in my comfortable desk chair. It is my inspiration for the year ahead and we have learned that the many vendors provide a hands-on experience with new fabrics and patterns and though we limit our shopping there, it guides our shopping for the year ahead as most vendors provide shopping on-line as well. For a quilter, one can never have enough fabric, notions or patterns! Need has little to do with our choices! 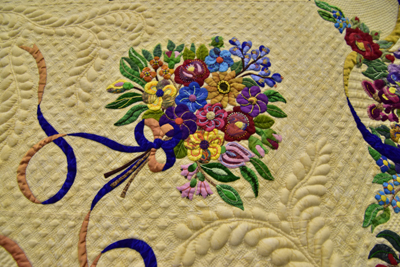 Check out the quilting, done with silk thread and by hand. Beautiful detail! I hope you will enjoy but a few of the pictures my husband took. I am not sure if you can enlarge or view these close up on your computer, but if you can, you will find the details simply amazing!) They represent but a few I randomly chose for this blog. Lighting can be difficult in such a setting, but I think my husband does these quilts justice in his photos. All credit goes to the brilliant home fabric artists that live in Vermont and the surrounding states and Canada. If you like what you see, consider that this is an an annual event held the third weekend in June and plan to come to it next year. 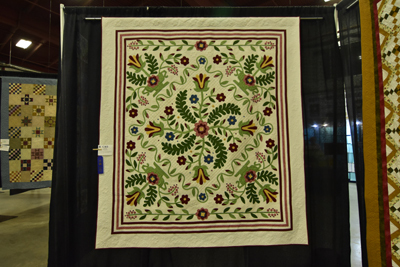 Details can be found on-line at The Vermont Quilt Festival web site. It usually lasts three days and they feature guest artists every year that teach special classes. "Tribute to Mary Mannakee" by Leslie Cook, Greenfield, MA. 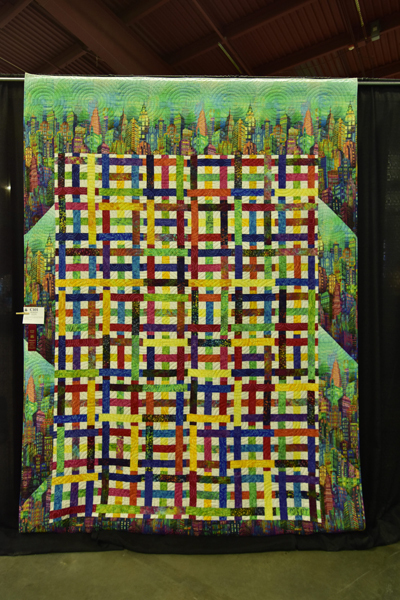 "Metropolis" by Mary Schilke, Wells River, Vt. Longarm Quilted. 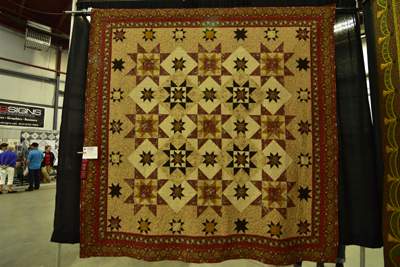 "Patience" by Susan Tamulaitis,Winthrop, MA.Domestic and Longarm Quilted. "Counting Stars" by Susan Rivers, Burlington, Vermont. Longarm quilted. 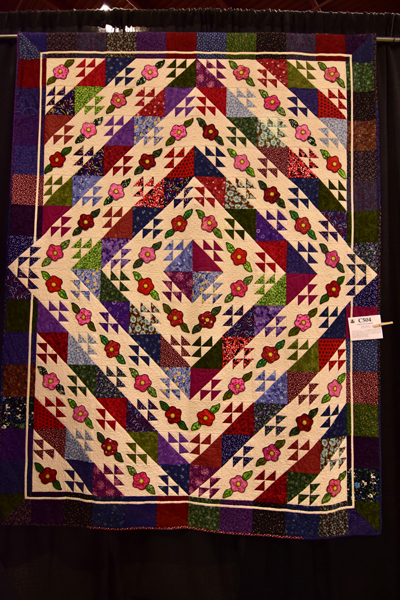 "Field of Flowers" by Mamie Rabida,Broad Brook,CT.Home Machine Quilted. 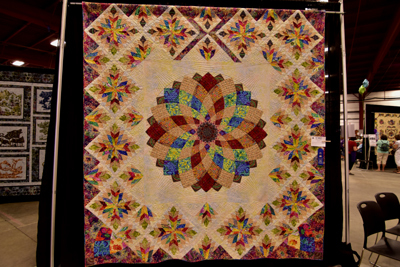 "Dahlia, Go Big" by Candi Reed, Douglas, GA. Long-arm quilted. Labels: The 2017 Vermont Quilt Festival. Schedule and plan now to attend the 2018 show!